Music Hall’s RDR-1 table-top radio is a reviewer’s companion. For when I was hard at work editing and typing reviews or making industry correspondences, the Musical Hall radio was there not simply playing crystal clear FM music from a classical station as never achieved by any other radios, it is also equipped with the Radio Data System (RDS) technology that displays stations call signs and music title, such as “BEETHOVEN EROICA IN E, OP 55”. Maybe the radio stations will begin to include information on performers before long. The RDR-1 has a 7-watt, 3-inch speaker that occupies about 3/8 of the front panel on the left, then 2/8 of the panel to the right is provisioned with a large TUNING dial, with a smaller but more protruded VOLUME dial beneath it. The large LCD display between the speaker and the TUNING and VOLUME is joined also by two rows of shiny chrome buttons below it. The little buttons on the first row control the adjustable, 4-levels of brightness of the LCD display, BAND/AUX selection, and M1 through M5 of PRESET STATION. The second row of the little buttons control SCAN/MONO, DISPLAY of miscellaneous RDS texts, SET, AF (alternate frequency for the tuned station), CT and finally, traffic news (an SUV symbol). 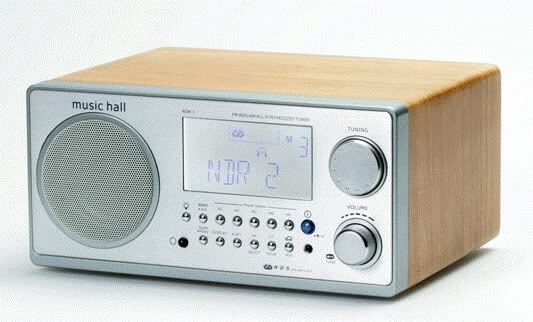 The Musical Hall FM radio clock has an internal antenna that pulls in stations my other radios couldn’t get, and it also has a rear switch to provide for external antennae reception via the included cabling. Tuning is of PLL synthesis via a large knob rotary above the VOLUME knob, and the tuning action is precise and smooth, a welcome break from the ubiquitous, maddening push-button variety. I used the M1 to M5 PRESET STATION buttons beneath the large, lighted LCD display. A rear port behind the speakers makes it very clear of what this little radio intends to do, and its ability to do it must be heard to be believed. Position this little warrior against a wall, adjust the bass to the highest level, and you want to crank it up and rock. Even with classical music. The one feature that will make any radio perfect is a DVR-like functionality, that records ongoing programming and allows rewind, so that when the radio host/hostess makes an announcement while I am working, I could rewind a few seconds and capture what he/she was saying. The addition of CD playing function would make this little warrior more triumphant, although I must conceit to the fact that radio listening through this Music Hall is so enjoyable that I am not sure I want to miss every moment of the revitalized FM experience. A credit card-like remote replicates all controls functions of the buttons on the RDR-1. I get it, Roy Hall must have thought about coining this little darling R2D2…This incredibly chic-looking little radio not only sounds very balanced for its size, with its maple veneer and cool aluminum trims, it adds a much-needed chicness and youth power to my daily routine. It’s amazing how differently I would feel around my workplace in the company of the RDR-1. Music Hall offers a dark wood trim on this little darling gadget, but I could use the lightheartedness of the maple-and-silver touch. By virtue of the fact that whenever I’m at work I would turn on the RDR-1, I now listen to the RDR-1 more than my reference audio system. So, the sleek-looking, décor-friendly, space-saving little RDR-1 accomplished the most amazing feat of becoming a most indispensable element in my daily activities. Will you please tell me if this radio has a port for headphones? Nighttime listening! According to the owner’s manual page 3 (accessed here: http://musichallaudio.com/pdfs/music-hall-audio-rdr-1-radio-manual.pdf), the unit has an “earphone jack” on the face plate. Hope this 3 years later reply helps!